So what do you do when life hands you oranges? Now that’s easy. You put them in your cake! A slice of this orange chiffon cake is entire spring served on your plate! Orange chiffon cake recipe-texture, taste and frosting! You can’t be sad with this cake in your hands. It is delightfully orange-y (is that a word?) and sweet from juicy oranges. Supremely moist and cottony soft from the method used in the recipe. We will get to that in a second. I know I’m singing a thousand praises of this cake and all. With the first bite you too will be a fan of its refreshing orange flavor and silky texture! I covered my chiffon cake with vanilla whipped cream. As you know sweet oranges and vanilla is a marriage made in heaven. You may also frost it with orange frosting to make this cake even more fruity! Personally, I sail with vanilla flavored orange chiffon any day. As the orange flavor is spot on in the cake itself. Why skip additional vanilla scent then? This cake is so moist and complete on its own that it barely needs a frosting. Now that is one big statement coming out of me. Cake without frosting? Bite into this cake once before calling me insane I’d say! I still frosted mine with a thin layer of frosting. Which I regretted later as I don’t see that thick coat of frosting in my pics. What was I thinking? Was I thinking at all? No cake is complete without four buckets of icing on it. Ever. Will never repeat that. You shouldn’t too. Unless your stretchy bottoms deny to stretch anymore of-course. Okay now back to real cake business. How are we making this cake business I mean! My inspiration for this cake came from this orange chiffon cake from rasamalaysia.com. It looks so gorgeous, moist and ticks all the marks of a perfect chiffon. I developed my recipe adding some leavener (which is baking powder here) in the actual recipe. Used cake flour so that the end product isn’t dense in the slightest. Cake flour ensures a truly light and light chiffon cake. Also baked mine as a layered cake. What else do we do to make this so light and airy? We whip the yolks and egg whites separately. Mix all the wet and dry ingredients together(except egg whites and some sugar) and then fold that batter in the stiff peaked meringue. That’s how this beautiful, orange scented and creamy batter comes into existence. Check it out. Also all those specs of orange zests in the batter. Pure joy! Also remember to use freshly squeezed orange juice in the recipe. Big no to canned/tetra-pack stuff out there! Nothing beats the flavor from fresh orange juice and zest here. We will whip our egg white adding some cream of tartar and sugar (1 tbsp at a time) till it forms nice stiff and glossy peaks. You don’t want to under whip or over whip your meringue. Under whipped one will sink your cake in the middle and it will taste all eggs. Ewww! You are baking a dessert not some omelette! And over whipped meringue may result into a dry and hard as bone bake. You don’t want that either. How beautiful this picture looks. I am obsessed with this those swirls. Silly me! The lemon cake post here uses this same meringue with stiff peaks. You can try it next. Its pretty much similar to this recipe with a few changes as lemons are fairly more acidic than oranges. You can line your tin with parchment paper for this recipe. Usually for the chiffon cakes to rise it is recommended not to grease or line them. But we aren’t aiming for much height here. Thus for a neater looking cake I’d suggest use parchment. We will cool our cake upside down. And the reason behind this technique is we want the air pockets in the cake to settle then and there as it cools. Therefore our chiffon cake holds its shape and doesn’t concentrate down into a sticky-lumpy mass. Separate your egg whites and yolks while they are still cold. The yolks don’t get mixed in the whites this way. And then bring your yolks and whites to room temperature. Your mixing bowl should be dry and non greasy. You are sure to whip a perfect meringue this way. Just take care of a few steps and you will be rewarded with the most moist, unsinkable and fluffy chiffon cake to flaunt! 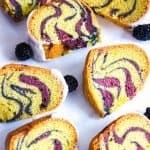 Try my blackberry swirled pound cake next! Or if you love oranges, you are going to love these super high rising muffins! 1. Preheat your oven to 320°F (160°C) and line two (6-inches) cake tins( I used heart shaped) with parchment paper. Make sure all your ingredients are at room temperature. 2. Add egg yolks + 30 gms to sugar to a mixing bowl and beat for a minute. Add oil, vanilla extract, salt, milk, orange juice and zest to the bowl and mix in till everything gets combined well. 3. Now add in atleast three times sifted cake flour and baking powder to the mixture and fold it in. 4. In a separate clean and dry bowl, add egg whites (at room temperature only) and beat in for a minute. Now add cream of tartar to it and beat well. Slowly keep on adding the remaining sugar (a tbsp at a time) and beating continuously until the egg whites form stiff peaks. This may take 5-6 minutes. 5. Mix egg whites in the orange cake batter in three batches. And fold in using a spatula. 6. Pour the mix in your cake tin and bake for 19-21 mins or until a tooth pick inserted in the center comes out clean. 7. Invert the cake tin, as soon as you take it out of the oven and let it cool down completely. Its very crucial that your egg whites are at room temperature, else they won't get whipped to full volume. Fold in the egg whites and the batter with light hands. You don't want the air bubbles to skip out of the batter. Keep an eye on the cake after 19 mns. Oven temperatures vary sometimes. Over-baking may result into a dry bake. You can make your own cake flour at home. Just take 1 cup all purpose flour. Replace 2 tbsp out of it with cornflour/cornstarch. And sift it 4-5 times. There you have it. Looks very soft and airy! That is one gorgeous cake, Neha! I can almost taste the orange and vanilla! Awesome photos,, too! Thanks for the recipe! Great picture and it looks yummy. This is just so pretty and bright! I like snow storms and sweaters but you are right, I miss summer 😉 . Im over winter by the end of January. Chiffon cake is one of my favorites! Take care. Wow Neha,this is such a beautiful cake, so full of colour and flavour to brighten up a cold season. Thanks so much. We sure need a little sunshine on our plates during winter!! Woah! What a fun and colorful cake. I love that you served this with a simple vanilla whipped cream. Talk about the perfection combination of textures and flavors! Do you deliver? 😉 And those orange curls…perfection! Thanks for all the appreciation David! These orange curls are my favorite part of decoration too. You said it right. Nothing beats classic vanilla and orange flavor. I definitely love winter for the cozy sweaters and warm beverages by the fire. But I also miss the sunshine of spring. This cake is a definite reminder! So warm and inviting. Love the orange and whipped cream combo! Thanks so much Leanne for stopping by and for taking time to read my post. Orange and vanilla cream always rock it together. Woah, I can just tell this cake will be light as a feather! I love, love, love citrus desserts if they are just like this, super light and just refreshing. Your decorations are perfect too! I love how much the colors just pop, the cake is gorgeous! Thanks for sharing! Thanks for all your kind words. You said it so right Neil! Snow needs to melt now and stay melted till the next year. 😉 Thanks for stopping by. Hi Agness! I am sure you are gonna love it to bits. 😉 Let me know how it turns out for you. Thanks for stopping by. looks beautiful with all the fruits! Fantastic recipe to try. I will give it a shot this weekend. Thanks Neha! Beautiful cake, I have never made a chiffon cake when you say to turn it upside down to cool I understand you can do that with the right pan but how do you do it in regular cake pans? Also can you make this cake in 8 inch cake tins? I don’t own any 6 inch ones. Would love to make this and your orange creamsicle one your cakes are so beautiful and the small amount of vanilla icing with the orange looks great, but like you I love lots of frosting. Thanks for posting your wonderful recipes. Hi Debbie! i just flip my pans on a wire stand to cool down. You of course can bake it in an 8 inch tin. So glad to hear that you are liking my recipes.